I am looking for contract work to fill my nights and weekends. I am open to a variety of front-end tasks, have the capacity to do design work, and could even dabble with back-end work (only if you're patient). I come with vanilla JS, Angular, AngularJS, and React experience. I am also a quick and eager study. I lead a remote Forbes dev team consisting of full-time and student intern developers. We work out of the MAGIC Lab on the Rochester Institute of Technology campus. The current project uses Angular, I also have experience with React, AngularJS, and vanilla JS. I have enjoyed almost four years as a college professor. I have taught many sections of twelve different courses, not counting independent studies and seminars, while maintaining outstanding evaluations (just ask ratemyprofessor.com!). I was also recently recognized among the top 10% best-reviewed professors in the Golisano College of Computing and Information Sciences. Kids on Campus exposes local 5th through 12th grade students to computing. I have directed all Kids on Campus operations for the past three summers, after working as an instructor in the program for five summers. Chain Gang Chase is a game project currently under development for the OUYA platform. I accomplished the front-end web, back-end web, and Java game development during a 20-day solo sprint in June 2013, have since run a successful Kickstarter campaign, and am working towards launch in May 2014. 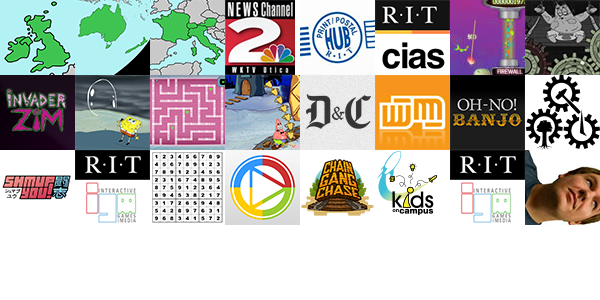 Just Press Play is a game-layer that augments the academic experience for students in RIT's School of Interactive Games and Media. I created the achievement scanning mobile app and the achievement visualizer portion of the user profile page. For fun, the geek in me made Fractal Sudoku as an experiment in creating a sequence of related Sudoku puzzles. Each minor grid expands and acts as a seed for the puzzle at the next level. Each level adds a power of 9 more puzzles to the game. During this time I made a few games, robustified my programming abilities, worked on many teams, wore many hats, and generally learned a multitude of useful skills. On a team with two others, we created our capstone game for Xbox 360 in C#/XNA. I helped iterate on the game design making rapid prototypes and also designed a system for adapting game text to different output resolutions. Picture the Impossible was a city-based game that was played in Rochester during Fall 2009, made by RIT students, faculty, and Rochester's Democrat and Chronicle Newspaper. I was the sole Flash developer responsible for five web games, each with seven weeks of serial content. As a project for a seminar in Alternate Controllers we created a Banjo-based rhythm game, in which there are fret and string buttons (instead of a single strum bar). I was responsible for the gameplay interface design, and aided with the banjo construction. I freelance for Workinman Interactive. On these projects I worked in ActionScript 3.0 using Workinman's existing in-house game engine. I wrote the gameplay scripting and communicated specs to in-house artists, who worked in parallel to create art assets for the final game. After Picture the Impossible, I continued working with the Democrat and Chronicle Newspaper. I helped create a series of data-driven web games that are tightly integrated with the DandC's drupal back-end framework. In Second Hand Swag, Patrick catches trophies thrown out of SpongeBob's window. I enjoyed scripting a tall swaying stack of trophies that reacts to player movement—move to fast, and the upper trophies will fall off the stack! For Valentine's Day Virus I studied an algorithm for procedural maze generation. The algorithm uses depth-first search with backtracking and visits each cell knocking down walls until all cells have been visited. The result is a "perfect maze." In Hurricane Havoc, players control SpongeBob who floats from island to island on a blown bubble while avoiding jellies. While randomly generating islands, I had to be sure that the gaps between them were challenging and actually possible. Good Gir Gone Bad takes place on a circular level that seamlessly wraps back upon itself. I had a lot of fun using polar coordinates and creating a dynamic camera system that makes sure both Gir and Dib are visible at all times. FrankenPatrick is a simplified spin-off of the Gears game I created for Picture the Impossible. Players drag and drop colored gears to create a gear chain that raises the inanimate FrankenPatrick up and up and up. Upon reaching the top of the tower, lightning strikes, which brings the monster to life. Hacker Attacker was my first-ever shipped title. Players draw "firewalls" to block incoming viruses from hitting iCarly's video data stream. As more viruses get through, the video bandwidth is decreased. The game is over when the feed becomes static. During this time I studied New Media Design—the coupling of visual design aesthetics and technology of the digital age. My senior-year design portfolio is still available at jp-design.net, though a small handful of the links have not aged well. The resumé there, while accurate, is also out-of-date. Along with class and study time, I worked 20 hours each week at the on-campus printing facility. This included customer service, digital print production, workflow efficiency, and finishing work. My part-time job during high school was at the local NBC affiliate television station. I was the production artist and studio camera or broadcast audio operator for evening and weekend news broadcasts. This trip was an excellent primer for the Art History courses I would later take in college. I had the opportunity to see many of the works discussed with my own eyes. You may see what my camera saw at p2p2004.jp-design.net. In preparation for this trip, I earned an open-water SCUBA certification. Photos for this trip are online at p2p2003.jp-design.net. "No worries," a common aussie phrase, has become part of my vernacular. Preparing for this trip taught me the value of hard work, as I earned most of the funds through lawn and yard work, odd jobs, and bottle and can deposit returns. I built my first-ever website, p2p2000.jp-design.net, to show photos from the trip.